Vote for the game that you think should win the matchup. Please vote on every matchup. Not having played a game does not disqualify you from voting. Please cast your votes in the format below, bolding the game that you choose to advance, with any comments on your selections placed after your votes. Polls are open until Friday, March 14th, 2014 at 11:59 PM EST. Enjoy! Pikmin 3 DOES Exist: Miyamoto says development "well underway"
Man I didn't realize what a brutal bracket this is. OoT, Galaxy, Super Mario World and Super Mario 64 all have legit claims at the top spot for me. 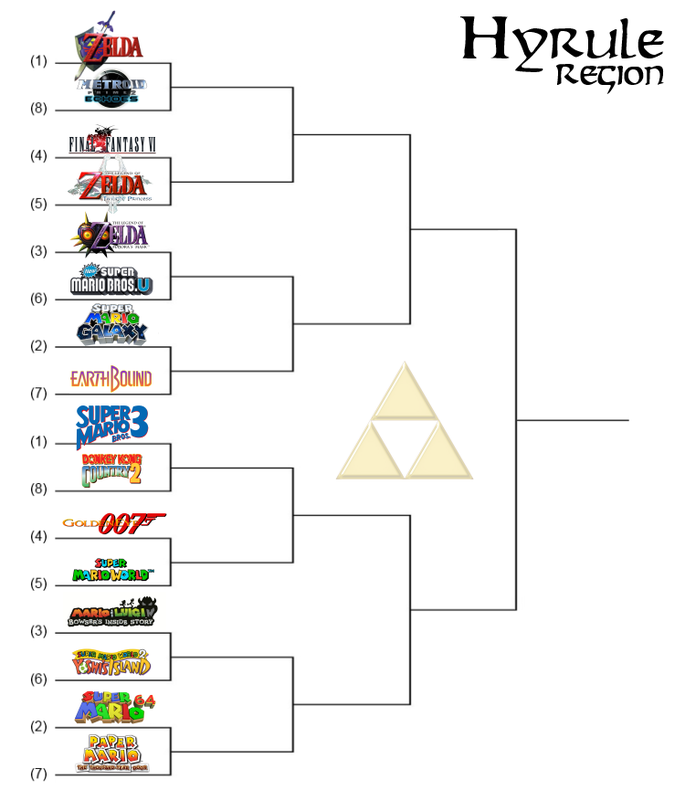 There sure is a hell of a lot of Mario and Zelda in this bracket, good Lord. Brutal bracket indeed...several of my Top 10 all time games are in this region. Poor Echoes...it's an unbelievable game, but the matchup is unforgiving. A1. Poor Prime 2. You can't win. You don't have the power. A4. HAHAHAHAHA. Oh man. This should be interesting. Have to go Twilight Princess here. A3. Majora's Mask. Not even a contest. A2. Galaxy is overrated, but it wins by default seeing as I haven't played Earthbound. B1. Eh I'm going to go DKC2. I always did enjoy it more than Mario. B4. Goldeneye, absolutely. Stiff competition though. B3. Haven't played BIS, and Yoshi's Island is a classic. B2. Sorry Paper mario, you're good, but Mario 64 is sublime. A) Easy choice for me. I'm definitely one of those OoT-lovin' such-and-suches, so I gotta go with my heart container on this one. 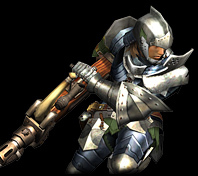 Also, I feel that Echoes is Retro's weakest game. B) ...On the other hand, I have no problem voting FF3/6 over TP. I enjoyed TP well enough but it's going against my 2nd-favorite game, and the only RPG I like more than EarthBound. C) The NSMB series feels way too disposable to me--fun when they come out, but I have trouble seeing myself replaying them 10 years in the future. Despite it's dated visuals, Majora's Mask IS something I like to return to from time to time, thanks to its great characters. D) It's pretty close, but EarthBound is my choice here. It's always been very appealing to me and I've played through it more than any other RPG. Sadly, I don't think it'll get further than this, but I could be wrong. E) DKC2 is one of my favorite platformers, but Super Mario Bros. 3 basically reinvented Mario 1's wheel. This is one of those games that completely blew my mind as to what video games were capable of, which means big bonus points in its favor. Also, Hammer Bro Suit. F) I appreciate what GoldenEye accomplished, but I can't say no to a SNES Nintendo platformer. SMW isn't my favorite in the series but it's still terrific. G) Another close one, but Yoshi gets the nod. I always thought this game had a wicked personality and a ton of stuff to do in it. It's a little collect-y but still charming as heck. BIS is also great, but a little more inconsistent in its gameplay. H) Well that's just not fair. TTYD is one terrific game, but my vote once again goes to the platformer. It's hard to pull off what SM64 did (another one of those mind-blowingly innovative games), so Nintendo's first 3D adventure gets the okay. Fortunately I have played all these games. 1. If it were the original Metroid Prime, this would have been a tough choice. Now, it's "great vs greater," and greater wins. 2. I like Twilight Princess, but Final Fantasy III is still one of the best RPGs if not the best, and so I must vote for it. 3. Majora's Mask could be a good game, but it has many terrible design decisions holding it back. 4. I don't know if I can really compare these games, so I went with Earthbound since I think it'll be crushed. 1Z. Both great platformers, but one inches it out. 2Z. A weird matchup, and I adore both games, but Goldeneye had the bigger "wow factor" for me. 3Z. BIS is good but still a letdown from the original Mario and Luigi. 4Z. Even if I liked Paper Mario, this'd be an easy choice. Any vote submissions altering the names that I have chosen to refer to the entrants in this tournament will not be counted as they disrupt the vote counting process. @Jargon Ha ha, all right, fine, I'll change it to what you want. May I ask how it would mess things up? As long as each game remains in its same slot then it seems like the full title doesn't matter. I cannot reveal details of the classified vote tabulating process. @Jargon Okay, I'll ask again once it has concluded. Just in case you made the rule for a different reason, I'll say that I just did it to be silly. If it were viewed as an annoyance then I'll cut it out, that isn't my intention. At a guess it might be some sort of lookup table dealy. Unless you get exact values, things can get messed up. Drives me batty at work when I'm trying to allocate things, lots of manual processing. 1. Contrary to popular belief, I don't hate Ocarina of Time. I'll be voting against it at some point, but for now it's clearly top game. Never finished Echoes for whatever reason, but I remember I didn't like it as much as the original or the glorious part 3. 3. Never played Majora's Mask. So it's NSMBU by default. I suspect I'll rate MM higher when I finally do play it. But no telling at this point. 4. Rough to see such a venerable little game like Earthbound go up against, for my money, the heaviest hitter in the bunch. But Galaxy's the better game, imo. So it's just one of those things that happens. Maybe next year, Earthbound. 1. SMB3 is still my favorite entry in my favorite genre. But DKCTF might... MIGHT... just knock it off. Diddy's game can't do it, though. Easy choice. 2. One of the tougher choices so far, but it comes down to this for me: Which holds up the best? And it's World, easy. Also, I'd like to set this up as proof I don't do strategic voting, as I think my beloved SMB3 is going to have an easier time next round if it doesn't have to confront World, which you guys always seem to prefer over it. Damn Yoshi-lovers. 3. Never played Bowser's Inside Story. Really love the humor of that series. So it's YI by default. 4. On an objective level, it's hard to deny the importance of Super Mario 64 and the thrill of playing it when 3D games were new. But this is a preference thing and I just loved Paper Mario TTYD even more. The humor. The approach to the RPG formula (not one of my favorite genres, frankly). The way it used Mario. I just love that game. Also: While it has the awful Mickey Mario voice throughout, it isn't the game that introduced it. Take that, 64. EDIT: Lots of Mario and Zelda heavies in this bracket. I guess that's a good thing, so they don't just clear the decks of everyone in every bracket. This is probably the toughest one, though. You got Ocarina, World, SMB3 and Galaxy all in the same bracket. What a bloodbath. Wow, I'm the only person who chose Prime 2. And probably will remain the only one. Yeah. If even I voted for Ocarina of Time, there's not much to hope for Echoes. You have both Majora's Mask and Mario U bolded... confusing to say the least! Yeah there was something odd with the formatting. Good looking out Fink.